Jacky says "Hey Diane, lets run off behind a shady tree"
"Well there Diane, we gotta run off to the city"
Oh, let it rock, let it roll. According to Mellencamp, "Jack & Diane" was based on the 1962 Tennessee Williams film Sweet Bird of Youth. 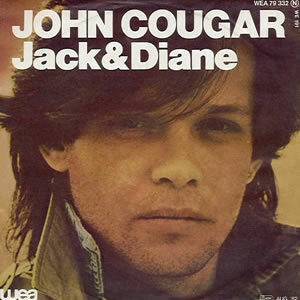 He said of recording the song: "'Jack & Diane' was a terrible record to make. When I play it on guitar by myself, it sounds great; but I could never get the band to play along with me. That's why the arrangement's so weird. Stopping and starting, it's not very musical." Mellencamp has also stated that the clapping wasn't supposed to be included in the finished song. It was recorded with the clapping in order to help keep tempo and then it was to be removed. However, he realized the song did not work without it.